Sold our house almost as soon as it was listed. She will go the extra mile for her clients. May be busy but still finds time ti speak with us. Kathy Valente has provided us with exceptional support, patience and service during a very difficult and complex short sale purchases. Kathy stands out for her patience and extra efforts to assist us in determining what is best for us. Kathy never pressured us to "make an offer" or insist we sign an agreement to sell before she would offer her insight, knowledge and sincere guidance. We will always seek Kathy's input and have recommended her to our friends and neighbors. Above and beyond in every aspect -- she is a true professional with a relaxed, let's do it, attitude. At a time when I needed compassion and understanding, Kathy Valente of Michael Saunders & Company entered my life. She sold my condo and became a good friend. How lucky you are to have her on your team. We have purchased many homes over the past 40 years and Kathy Valente has been the best. She is knowledgable of the real estate market and customizes everything toward our needs and desires for finding a new home. I would highly recommend Kathy as your real estate agent. Working with Kathy has been a real pleasure for my husband and I as we struggled to find a retirement community that met our current needs. She worked long and hard, as well as above and beyond what we ever expected to help us. She and the Michael Saunders team were always available to answer any questions we had and to solve any problems that arose. We would highly recommend her services if you are looking for impeccable, friendly service. Thank you Kathy, with your help, we are now living our dream! Kathy recently sold our house in Bradenton for us. This was the most recent of five sales or purchases in which Kathy has been our agent. Obviously, she has our confidence. She has also spent considerable time over the past 25 years showing homes to prospective employees of our practice in Bradenton. I view her as a valuable recruiting tool. Kathy is the consummate real estate professional. She knows what her clients want and needs even if they don’t. Her advice is sound and never self-serving. She is available 7 days a week and has a competent professional staff. I recommend her to anyone in need of a realtor. Kathy Valente is not just your standard realtor. 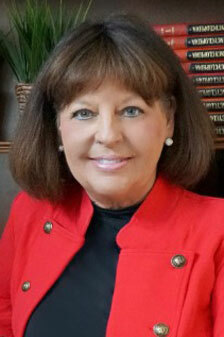 We have known Kathy for many years, and would never venture into a real estate transaction without her. We have bought and sold several homes utilizing Kathy's remarkable talents as a skilled facilitator, which really puts her above your average Realtor. Kathy is kind, contentious and a cut above. When speaking to friends, family and acquaintances, we tell them we would never venture into any real estate transaction without her. - Dr. Chris & Laurie E.
Very knowledgeable and professional. Enjoy working with her. I would readily recommend her to my friends and relatives. Such a pleasure. Kathy and the staff are not only professional and courteous but extremely responsive. So appreciated! Even after the sale when some additional paperwork was requested, it was provided swiftly. I highly recommend this organization. Many thanks to all! Bought and sold a couple of houses with Kathy; she’s the best. We received a contract only one day after listing my San Remo house. Kathy has been our Realtor of choice for many years. She’s not only a good Realtor but also a good friend. I had spoken with Kathy a few years back when she sold my neighbors home and when I was ready, I reached back out. As you know, Kathy has a great reputation in West Bradenton for good reason, she knows the important factors and guides you along the way with very honest feedback. I enjoyed working with her team, they were all professional and attentive.The only concern, negative was that unfortunately some of the realtors did not securely lock the home and/or leave it as they found it after showing. Nothing happened as a result, but that is an area of mention.Your company is so well regarded in our area, thanks to you, I will always consider recommending /referring and or utilizing your services in the future. Kathy knows exactly what she's doing! My house was listed, shown numerous times, publicized in many ways, and SOLD in two months! The first realtor I chose was not nearly as proactive and didn't get the job done in nine months. Kathy is a true professional! We've known Kathy for years and she was our first choice to purchase our new home. She has extensive experience and her knowledge and expertise is outstanding in the local real estate market. She worked with us every step of the way and always made herself available. Kathy Valente was my realtor for the sale of my house that I had lived in for 19 years. It was a very hard decision and process to leave after all of that time, but Kathy helped me to get through the process with her professionalism and caring. She was truly a Godsend to me and my appreciation will never end! Thank you again Kathy for everything you are and everything that you do. I can say it all in a few words. A1 FIRST CLASS !! Thank you Kathy and Gregory. Beatrice. I would like to express my sincere appreciation for the dedication, diligence and tenacity of Kathy Valente. Her communication skills and devotion have been remarkable. She has tirelessly pursued several difficult real estate transactions for me in the last several years (which would exhaust any mere mortal) that has taken her into a long international odyssey. I think this may qualify her as international ambassador agent of the year! She always stayed cool and calm throughout our many communications, and displayed a wonderful willingness, warmth and sense of humor throughout it all. She is definitely special and one of a kind, and deserves all my compliments and admiration. With much gratitude and appreciation to all at Michael Saunders & Company. Thank you! Kathy has been easy to work with and has always taken the extra step to make sure our rental has been everything she had promised. We love Kathy; she sold our house in 48 hrs. Not only did we have one offer, we had 2 offers. Kathy knows the market and has the knowledge on how to market and sell your home. Just let her do her thing and you will be in the money! She is the best professional! She is much more than a realtor; she is a Best Friend for life. - Marcie & Terry M.
She has gone out of her way to help us, which is above and beyond any realtor we have ever used before. We would highly recommend her to anyone buying property in the Bradenton, Florida area. Kathy Valente has sold numerous properties for me. She’s also led me to my homes. I trust her implicitly and recommend her highly ! Our agents Kathy Valente and Jan Spring were both very personable and had a firm grip on all aspects of selling our home. The entire experience was good from start to finish and we have already recommended Michael Saunders and both agents to everyone interested in selling their home. I’ve just listed my second property with Kathy, so pleased at how competently the first sale was handled. She is the total package. You get first-class service regardless of the list price of your property. She represents you, the seller as if it’s her only priority and it doesn’t hurt that she has the unequalled arsenal of Michael Saunders resources at her disposal. Kathy is the best. She has helped us buy or sell four different houses over the past 13 years. She is professional, competent, honest and patient. I doubt that anyone knows the local real estate better. I know that no one will work as hard for you. It was a pleasure meeting and dealing with Kathy, who, obviously, would receive a 5 - star rating! Thank you, Kathy! Kathy, you are my favorite Realtor and friend. I smile every time I think of you and what you helped us do. I can never thank you enough for your persistence and professionalism. Kathy sold our house in Woodland Park in a DAY! At the highest price record per square foot! Her knowledge of the market is top notch. Not only is she a star real estate agent she is a great friend and golfer. Her expertise is above all the rest! Happy to have Kathy as our favorite broker. She has sold my sister a home and also our friend has bought and sold houses with Kathy. She is a true WINNER in the market. ?????? Kathy is a true professional. She knows her craft and delivers beautifully. This is our second time using her. We highly recommended her. Kathy is a no nonsense realtor who knows her job and knows how to sell a home for the best price in the shortest time. Kathy sold my home for asking price in less than 24 hours. Not only did she sell my house,she bought it to closing without drama, hand wringing and bickering. All of which makes for a wonderful experience. If you want a realtor to do the same for your property then Kathy Valente should be your Realtor.